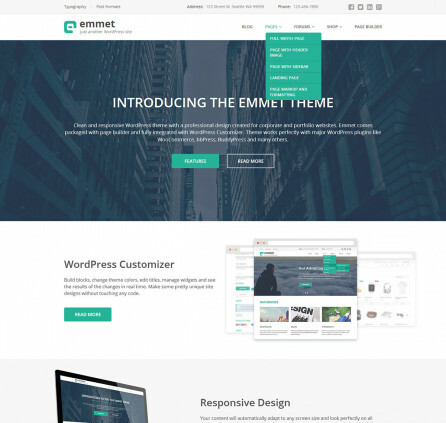 Emmet Lite is a powerful free WordPress business theme used by thousands of solopreneurs and agencies worldwide. You’ll enjoy a straightforward one-page style design, without any clutter and wrong plugins. 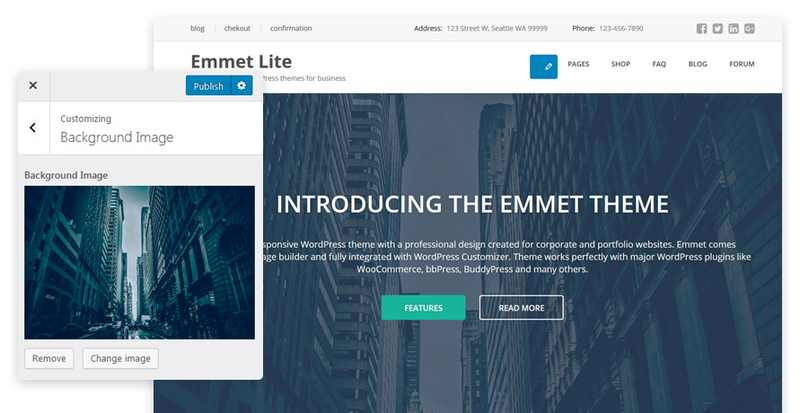 Emmet Lite supports smooth Parallax effects, a full integration with WordPress Customizer for editing the website essentials in a real time and more. Add the image associated with your brand right in the Customizer > Background Image. 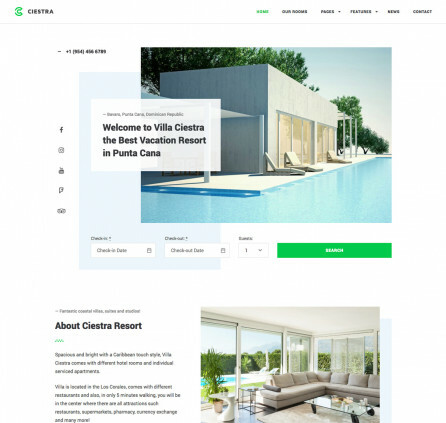 Using the fixed format you’ll get a stunning, high quality full-width header image. You may customize the image and background size. If you need to insert a header video, you need to get the Emmet Pro theme. Grab visitor’s attention with the hero content – introduce yourself using a big title section. You are free to add the title and description to this section, customize the labels and links of the buttons or completely hide them. Your content will be displayed right onto the background image. Edit it in the WordPress Customizer in a real time. 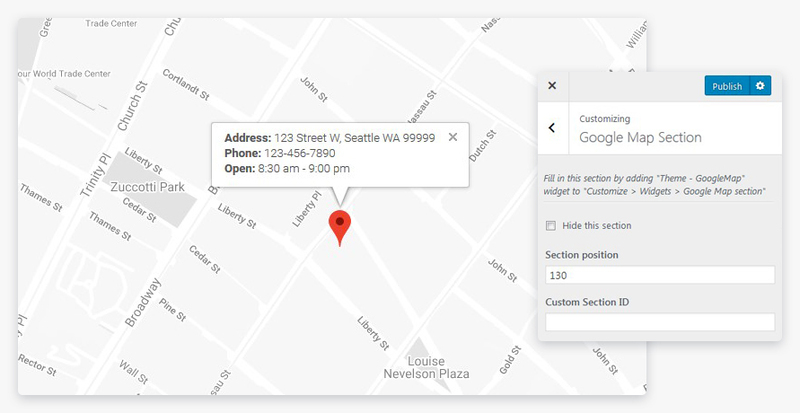 Start adding more info about your brand within Feature sections: update the description, craft button labels and apply URLs to them, insert associated images. You may optionally set smooth animation effects for both content and the image. Emmet Lite comes with 2 sections of this type. If you need unlimited Feature sections, you need to get the Emmet Pro theme. Emmet Lite allows you to change a default green color scheme to a blue, red or orange one. Moreover, you may set custom colors with a color picker: change a header text color, background color, text color, accent color, accent hover color, and a sub-menu hover color. Use this call-to-action section to guide your website visitors through the buying journey. You may customize the title and description of this section, change and link the buttons, control the appearance of content with the different fading animation effects. You may also set the position of this content block on the front page. 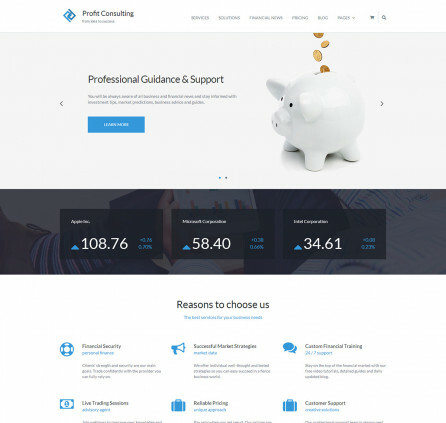 This is just the right section to briefly list your services or describe the benefits of your company. Here you’ll be able to edit the title, description and animation effects right in the Customizer. There are also lots of Font Awesome icons to use for your features. To add actual content of your features, you’ll need to go to Widgets > Features section. 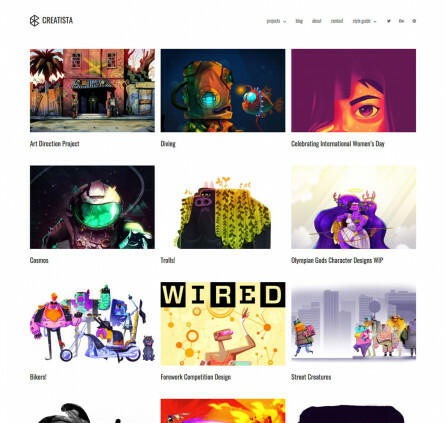 Add more imagery to your custom portfolio. Open this section in the WordPress Customizer to edit the title, description, animations effects and the section position on the front page. 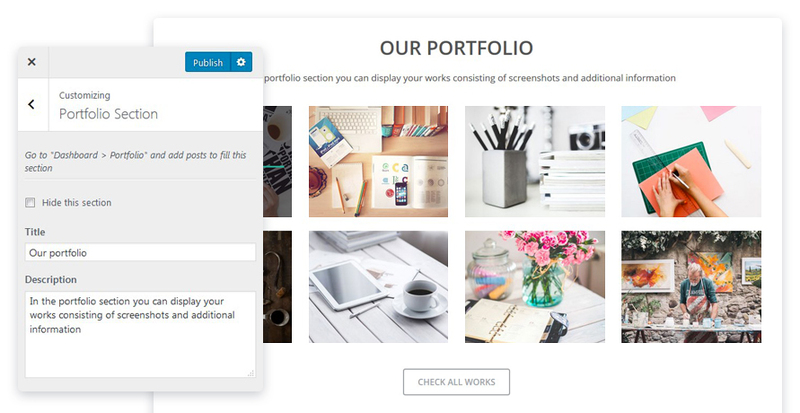 To add text and images to the actual portfolio projects, go to Dashboard > Portfolio. 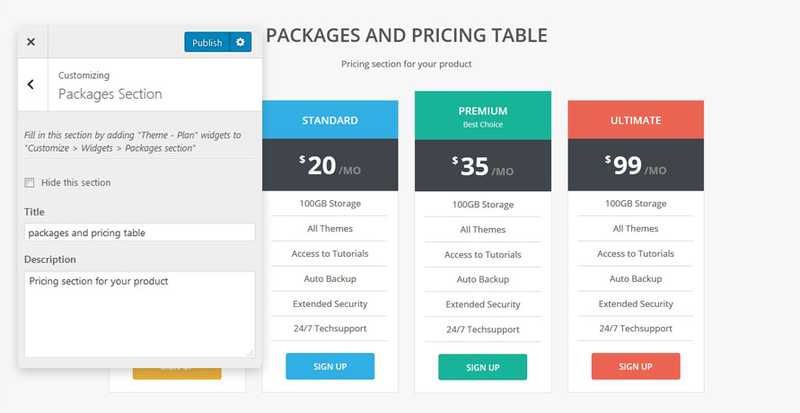 If you offer different pricing packages for your services, the comparison table may come in handy. To add all plans, you need to firstly add plans content with a Plan widget and then add it to Widgets > Packages section. With the Customizer, you can edit the animation effects and the description of this section. Show the real people behind you company: tell about the team and show the members in the Team section. To add a photo, name and a position of every staff member, go to Customize > Widgets > Team section. Easily collect email addresses of the site visitors with a simple newsletter subscription form. All content and animation effects can be changed in the WordPress Customizer. Add the widget via Customize > Widgets > Subscribe section. Add testimonials in a stylish way – optionally make this block appear with custom animation. To add your testimonials to the front page, make sure to add the Testimonials widget via Customize > Widgets > Testimonials section. Emmet Lite is integrated with Google maps – you just need to add a Google Map widget via Customize > Widgets > Google Map section. Your map with custom location markers will appear on the front page. Emmet Lite comes with a pre-built contact form, which can be customized by editing all essential fields like titles, descriptions, email address, etc. The form comes with reCaptcha protection ensuring your website is provided with the latest spam protection technology by Google. If you need a more complex form, you can replace this default form with your own form shortcode. 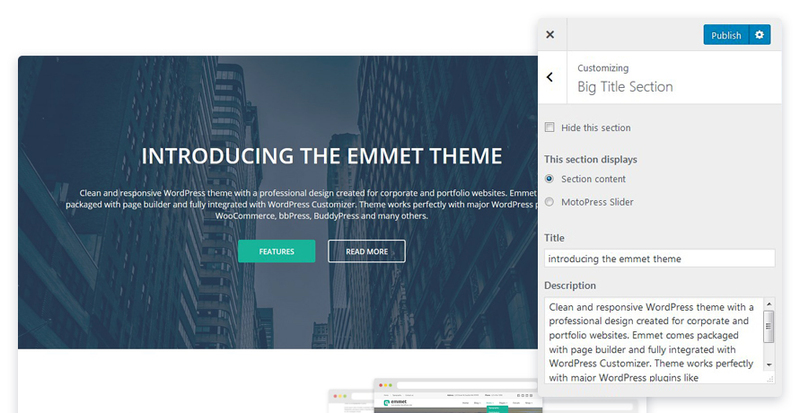 With Emmet Lite you can set different page templates: a full-width page, a header image page, a page with sidebar, and a landing page. 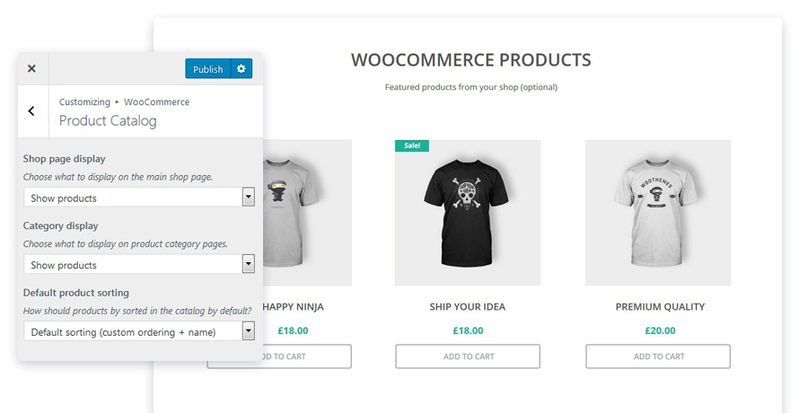 Emmet Lite is fully compatible with WooCommerce plugin letting you create a professional online store.